This is a Flickr badge showing items in a set called Bending Light. Make your own badge here. Commorants Dream of Pike in the Sky, originally uploaded by Telzey. I'm baaack! Armed with a new computer -- a 27-inch iMac -- and plenty of ideas. This image has been haunting me for some time. The cormorants were shot at a nearby duck pond ... but they stared off into nothingness, as cormorants tend do. 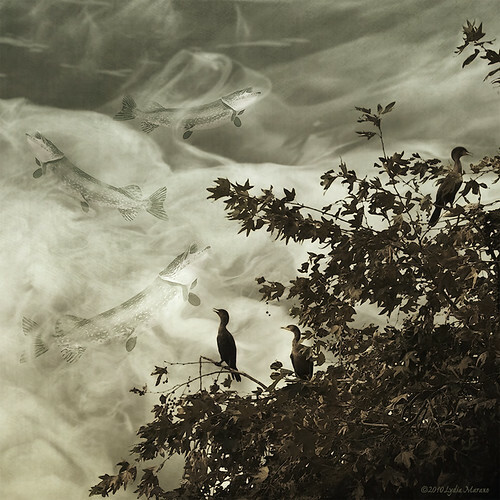 After many layers of textures, I ended up with a prettier shot of cormorants staring off into nothingness. If only I could see what they saw. The clouds are actually a photo of dry ice vaporizing in my pool. And, how about some lovely pike for lunch? More textures, more processing using NIK Color Tools. Tons of layers and over 1GB! I'm not sure I achieved the Asian scroll look I was going for. I may try another, more stylized version of this soon. Clomid for Men: Apakah Meningkatkan Kesuburan? House hunt in France, September.